It’s 2018. No one should need to be convinced of just how dangerous distracted driving is, particularly distracted driving that involves cell phone use. Based on our research, 40% of Texas drivers admit to using their phones either “Sometimes” or “Always” when they’re behind the wheel, a percentage which is likely lower than the reality. In September 2017 the Texas legislature finally acted to make texting while driving illegal State-wide. According to the Star-Telegram, drivers cited for texting while driving face a misdemeanor charge, a fine between $25 to $99 ( $200 for repeat offenders) and anyone convicted of texting and driving who causes serious injury or death to others faces a fine of up to $4,000 and as long as one year in jail. 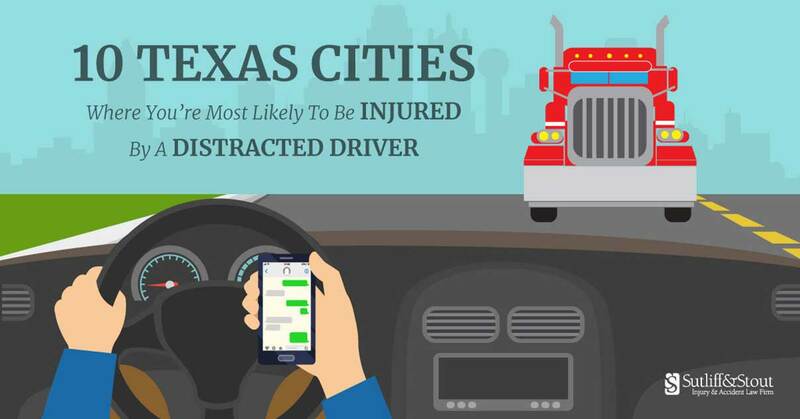 Is texting while driving a bigger problem in some Texas cities than others? Given their size, it is obvious that Texas’s largest cities experience the most total cell-phone related crashes and injuries. However, when you look at the numbers on a per capita basis, the results are surprising. Based on the last five years, we have ranked the top 10 most dangerous cities in Texas based on cell-phone related injuries and crashes per 100,000 people. Click here to see a list of the Texas cities with the fewest drunk driving deaths per capita. For complete details on the methodology used to rank these cities, click here. Waco takes the number 10 spot on the list of Texas cities with the highest cell phone crash injury rates. Waco has seen the 14th highest total number of cell phone crashes in Texas (158) over the last five years. Those 158 crashes produced 90 injuries and 1 fatality. At number 9 on our list is Pharr, Texas. Pharr has a population of just over 74,000 people and has averaged 17.4 texting and driving crashes and 14.1 injuries per year over the last five years. Thankfully however, none of those cell phone crashes have resulted in a fatality. Conroe, Texas is located about 40 miles north of the city of Houston. With a relatively small population of just over 65,000 residents, this city has reported a total of 62 cell phone related crashes since 2013. The city of McAllen has seen an annual average of 14.54 cell phone crash injuries per 100k residents over the last five years. That includes 102 total cell phone crash injuries, and sadly, 1 fatality. The “Capital of the Rio Grand Valley” comes in at number 6 on our list of cities with the most injuries caused by cell phone crashes, averaging 14.6 cell phone related crash injuries per 100k residents. In total, Harlingen residents have suffered 48 injuries and 1 death as a result of cell phone related crashes. Located outside of the Dallas/Fort Worth metro-area, the city of Grapevine claims the fifth spot on our list. This small suburban city of just 51,000 people sees injuries occur in 48% of all cell phone related crashes. Next up, with a population of 121,000 residents and centrally located in West Texas is Abilene, TX. The city of Abilene has been stuck in a sort of stalemate when it comes to cell phone related crashes and injuries. Over the past five years, the number of reported cell phone related crashes has stayed flat. In addition, 4.2% of cell phone crashes result in an incapacitating injury. Irving, TX offers residents beautiful sunsets, vibrant arts and culture, and one of the most dangerous cities in Texas for cell phone related crashes. In the last five years, there have been at least 317 reported crashes due to texting and driving, and 65% of the time there was an injury involved. At number 2 on our list is Richardson. 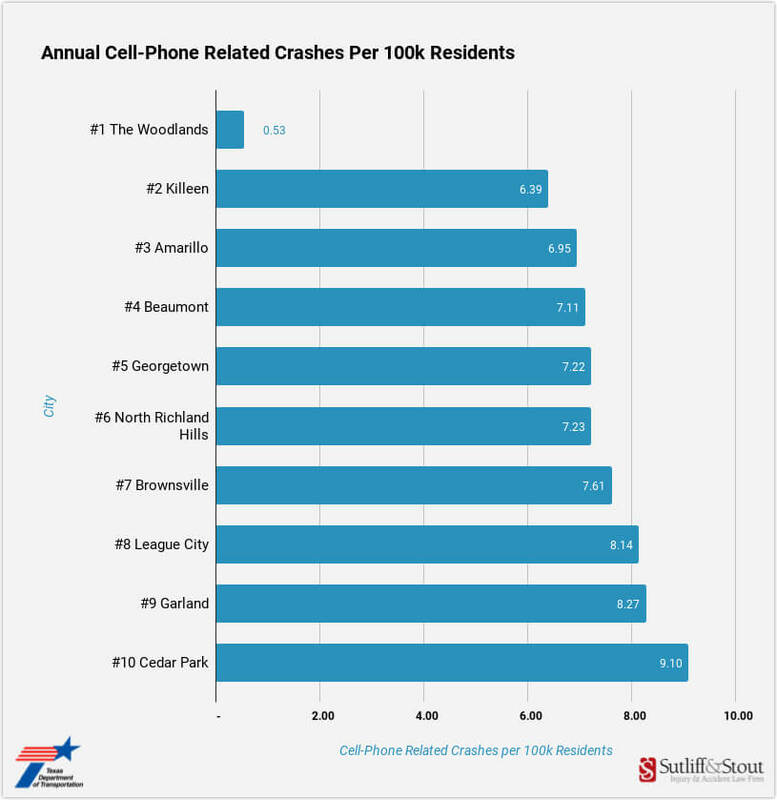 Richardson has a population of almost 111,000 residents and has been home to 206 total injuries caused by cell phone related crashes over the last five years. Over that span there were 317 total cell phone related crashes, meaning that 65% of all cell phone crashes resulted in an injury. The city of Longview tops our list as the Texas city where you’re most likely to be injured in a cell phone related crash. 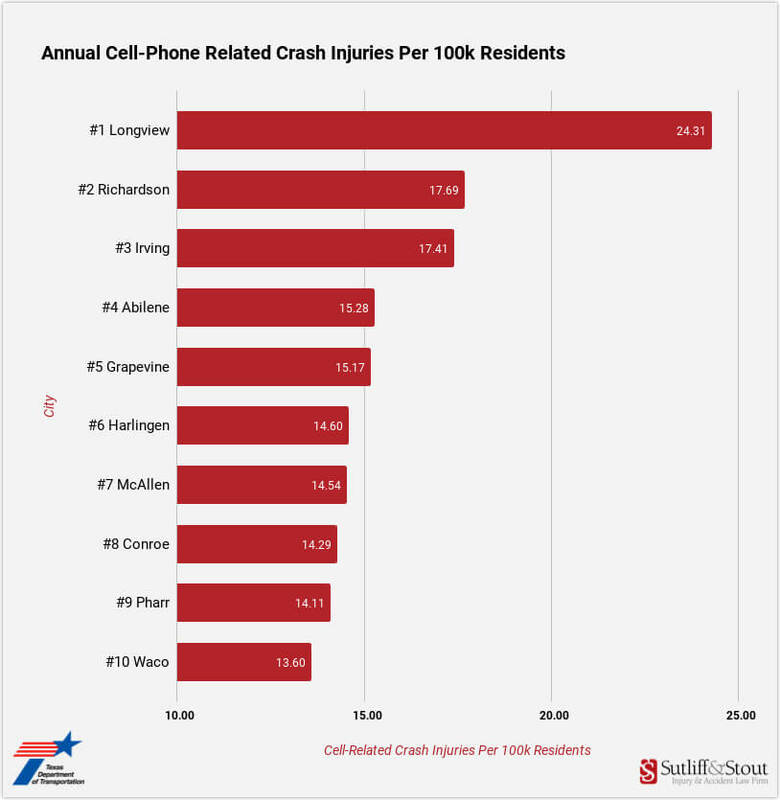 At 24.31 injuries per 100k residents, Longview’s total cell phone crash injury rate is nearly seven higher than the next closest city. In the last five years, Longview has been home to at least 141 total cell phone related crashes; those crashes have resulted in 100 injuries and, tragically, 4 deaths. Of 2,929,044 total crashes from 2013–2017, 27,042 of them (0.92%) were reported as involving cell-phone use. 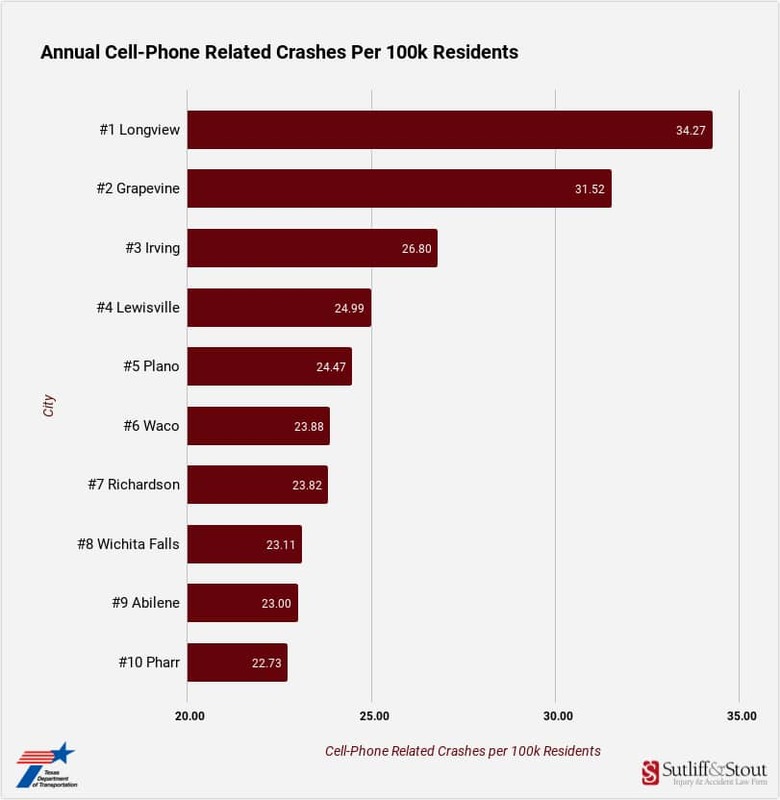 In Longview, the city with the highest cell-phone related crash rate according to our analysis, the percentage of total crashes that were reported as involving cell phone use is 1.13%, 19% higher than the state-wide total . Of 16,418 Texas crash deaths from 2013–2017, 316 (1.92%) resulted from crashes involving cell phone use. Using TxDOT’s Crash Query Tool we obtained city-level Texas crash data for all Cell Phone Involved Crashes over five years, from 2013 to 2017. We narrowed the list of cities down to only those with a population of over 50,000 people as of 2015 (64 cities). We calculated the average number of cell phone related crashes and injuries per year, per city over the five year span.